A Gantt chart can be an eye-catcher as well as an intuitive and useful planning and scheduling tool for your users. 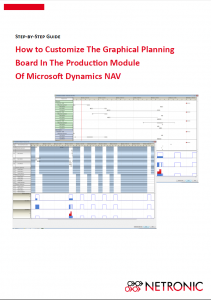 Microsoft uses NETRONIC´s VARCHART XGantt component to create the Gantt diagrams in the Production Schedule of the Manufacturing Module in Microsoft Dynamics NAV. This means, that VARCHART XGantt is already seamlessly integrated to Dynamics NAV and is used to provide both the Production Order View and the Resource View. You can download the step-by-step guide here.